It is fitting that in this issue, where an article on Douglas Circuit appears, an account of one of Manxland’s sons should be given. John Kinnish was born in a Manx village, but removed to Douglas in his teens, and, coming under the influence of the Rev. W. Curry, Alderman King, J.P., and W. Proctor, J.P., he was converted in the Loch Parade Church. The Revs. E. Quine and W. Carr joined in developing his gifts, urged him to prepare for the ministry, and, guided by them, he became Hired Local Preacher at Nelson (Lancs), where the Rev. J. T. Barkby continued the good work of counsellor and friend with great kindness and profit. So do good men lay their hands on youth and secure a worthy succession when their own work is ended. Two years in College having made their distinctive mark, Mr. Kinnish spent his probation on the Newton and Hyde Circuit, at the end of which he was stationed at Trafford Park (Stretford Circuit), serving subsequently at Newbury, Stoke-on-Trent, Clay Cross, and Ashton-under-Lyne, where he now resides. In these spheres of labour he has known the joy of prosperity and at Hyde, Newbury, Clay Cross and Ashton he initiated, and carried through with success, big renovation schemes. But the business and material prosperity of the circuit has not been his only concern, although he loves the House of Prayer to be beautiful and attractive, for one of his main activities has been the faithful shepherding of his people. In this he believes as an end in itself, and as a means to an end, and has discovered its value in a hundred ways. When one thinks of the innumerable tasks of a circuit minister it is a matter for wonder that any margin of time can be found for outside work, and yet our ministers are ever to the fore in this, and our brother is no exception to the rule. At Hyde he was President of the C.E. Union; at Stoke-on-Trent, Secretary of the Free Church Council, and a member of the Board of Guardians, and he is the present President of the Ashton Free Church Council. 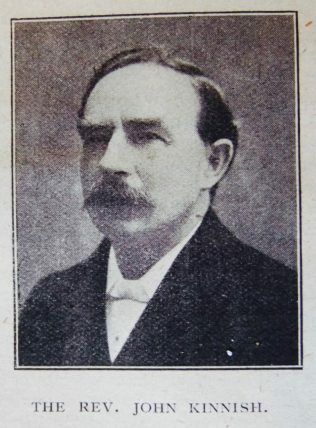 He has served three Synods as Secretary, and the Tunstall, Brinkworth and Manchester Districts as Secretary of the Temperance, Orphanage and Building Committees. Mr. Kinnish is a diligent student, a faithful minister of the word, and a great lover of the young. JOHN KINNISH: born at Malew, Isle of Man, in 1877. He received his early Christian training in the Loch Parade Church in the Douglas Circuit. He was appointed Lay Pastor in the Nelson (Lanes) Circuit, and later entered Hartley Victoria College to prepare himself for the Ministry. His service to Methodism was marked by great devotion and ability. For thirty-nine years he gave himself without reserve to the building up of the churches under his care. His sermons were fresh and rich in thought, and gave evidence of a well-trained mind and of a virile, Christian experience. His pastoral responsibilities were faithfully and tenderly fulfilled. He loved his people with a genuine affection and was greatly loved in return. He was modest, genial, courteous, and self-sacrificing. As a circuit administrator he faced difficulties with wisdom and courage. His considerable gifts, laid upon the alter of service with complete consecration, made him a very successful servant of Christ. He was compelled to retire in 1942, but found ways to continue a limited ministry until shortly before he was called home on the 22nd January 1949, in the forty-sixth year of his ministry and at the age of seventy-one. John was born in 1877 at Malew, Isle of Man. John married Florence Annie Dinning (1883-1969) in the summer of 1909 at Chatsworth Rd PM Chapel, Chesterfield, Derbyshire. Florence was the daughter of Rev. W. Dinning. Census returns identify one child. John died on 22 January 1949 at Tettenhall, nr Wolverhampton, Staffordshire.